To be used with GoodSync ver 9.9.58 and higher. Applies to GoodSync for Windows, Mac, Linux, and NAS unless noted otherwise. 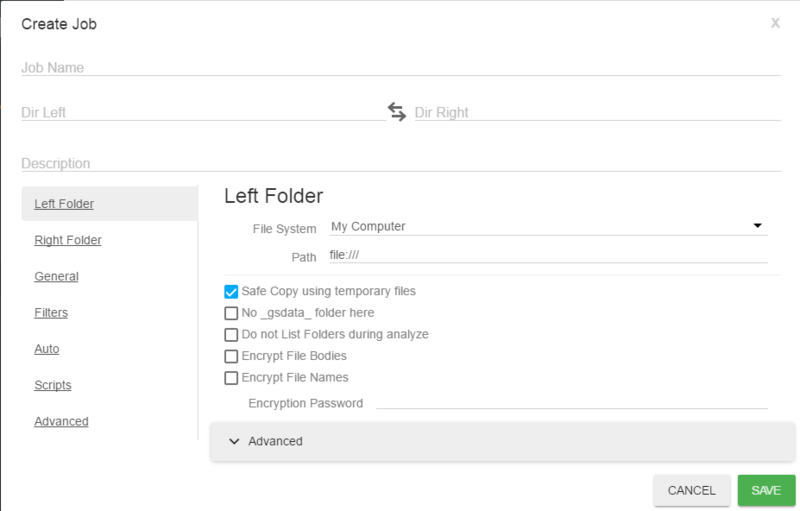 GoodSync synchronizes two or more folders with files, that is, GoodSync makes sure that folders and all files in them are the same by copying the new or updated files from the folder where they appeared to the folder where they are old or not present and by propagating deletions. 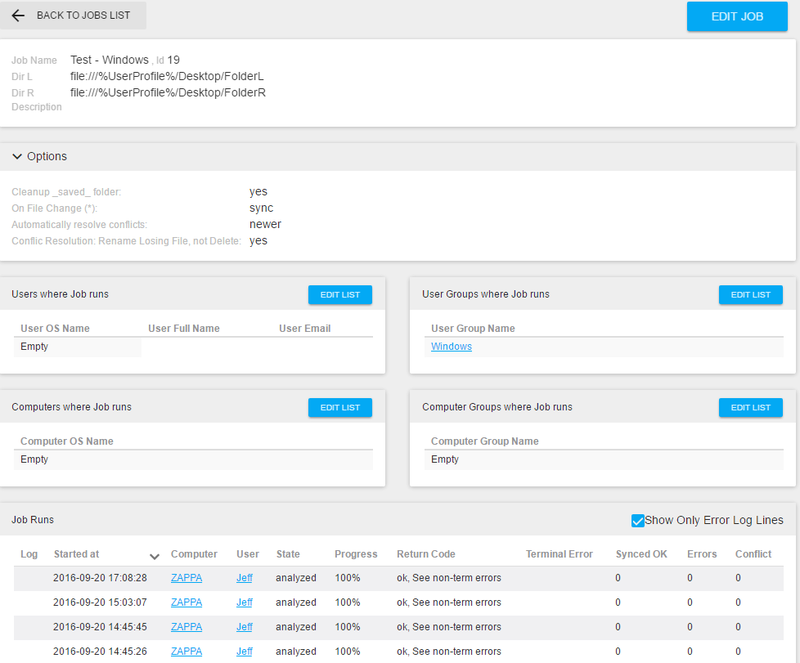 The GoodSync Control Center centralizes management of all of your GoodSync clients (Windows, Mac, Linux, NAS, Server, Workstation), centrally distributes your GoodSync Jobs, and Reports on your Job Run statuses. The GoodSync Control Center is our online service that allows a Company to create and manage GoodSync Jobs for Users and Computers. All Company management is done online and is connected with GoodSync Workstation and Server installations. An Administrative User will need to create the Company. Users and Computers are then added to the Company. After a User / Computer is authorized, they will receive any GoodSync jobs that they are assigned. Users / Computers in Groups will receive all GoodSync Jobs assigned to that Group. As a GoodSync Job run, its status is reported back to the Control Center for easy centralized monitoring and reporting. Getting started with the GoodSync Control Center is easy, follow the steps below from top to bottom. Submit the information for your Company. 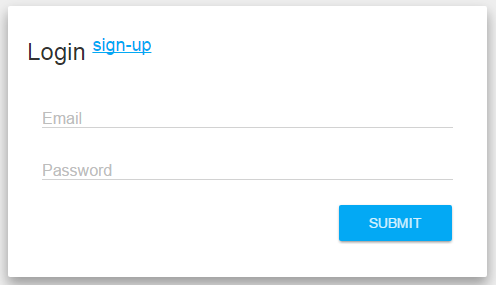 Once the Company Account is created you can log in and proceed. After logging in, you will see the Control Center Dashboard. It consists of a navigation menu on the left. To switch between menu options, click any of the Navigation links. Dashboard contains global Company information including Job Run errors non-running Jobs, and basic Control Center Statistics. Administrators allows management of Company and Group Administrators. Users allows management of Control Center Users. 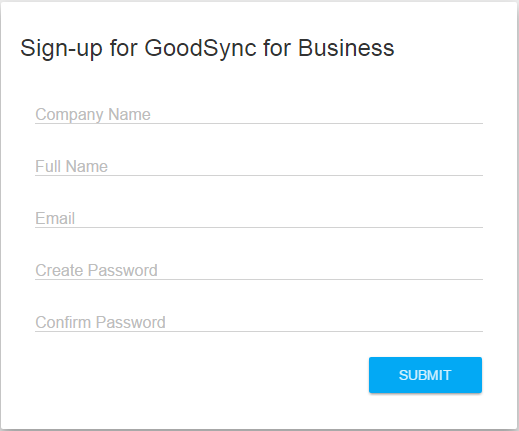 Administrators may join Users to Groups and assign individual GoodSync Jobs. User Groups allows management of Groups of Users. Administrators may use Groups to mass deploy GoodSync Jobs to Users within a specific Group. Computers allows management of Computers. Administrators may join Computers to Groups and assign individual GoodSync Jobs. Computer Groups allows management of Groups of Computer. Administrators may use Groups to mass deploy GoodSync Jobs to Computer within a specific Group. GoodSync Jobs lists all GoodSync Jobs available through the Control Center. 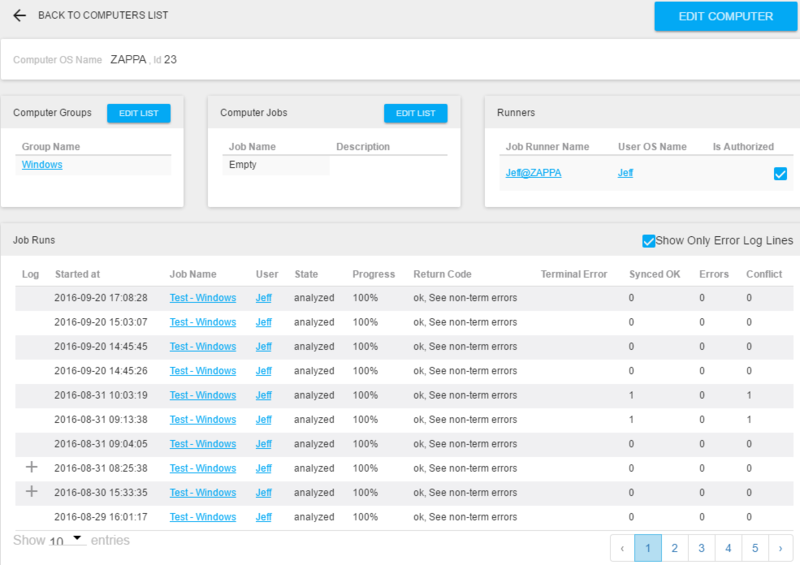 Administrator may add/remove and edit all Job options, and assigned Jobs to Users / Computers/ Groups. Accounts lists a Read-Only view all all uploaded Accounts available for use by Jobs within the Control Center. Administrator may upload Accounts from the GoodSync GUI. Runners are a combination of a specific User from a specific Computer. The Runners are approved by Administrator before Jobs are sent to the Client. 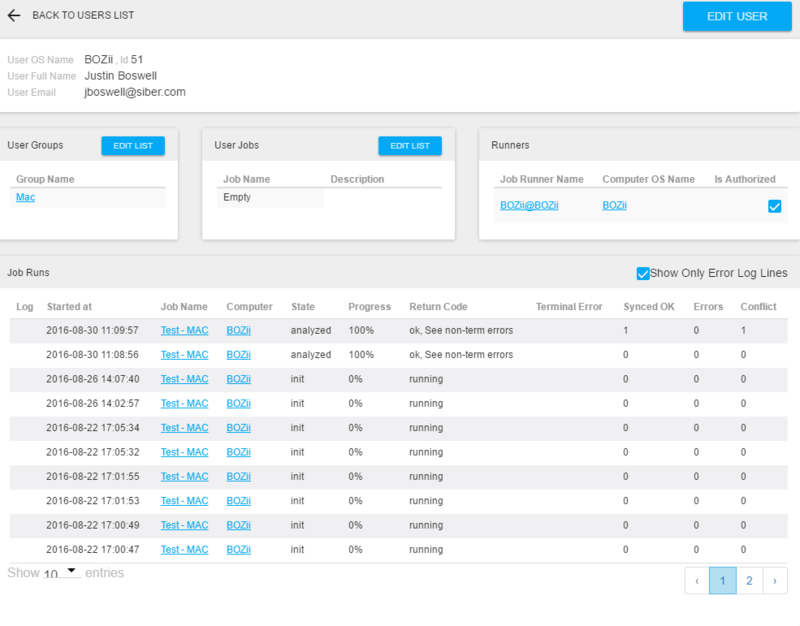 Job Runs show detailed GoodSync Job information on all Backups and Synchronizations for all Runners. 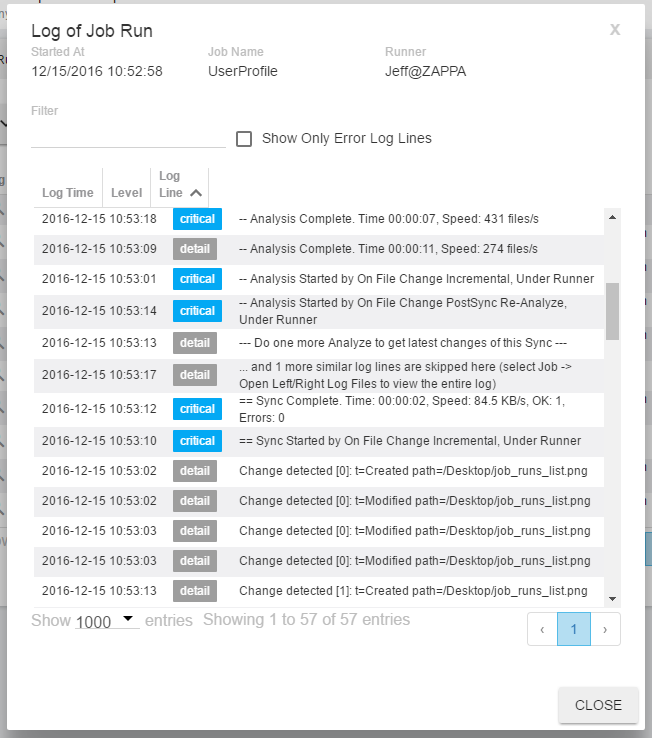 Reports show compiled GoodSync Job information on specific Backups and Synchronizations for all Runners. Documentation is this page and all sub-pages / sections. Settings contains global settings for the Control Center including Program Options, and Authorization Options. 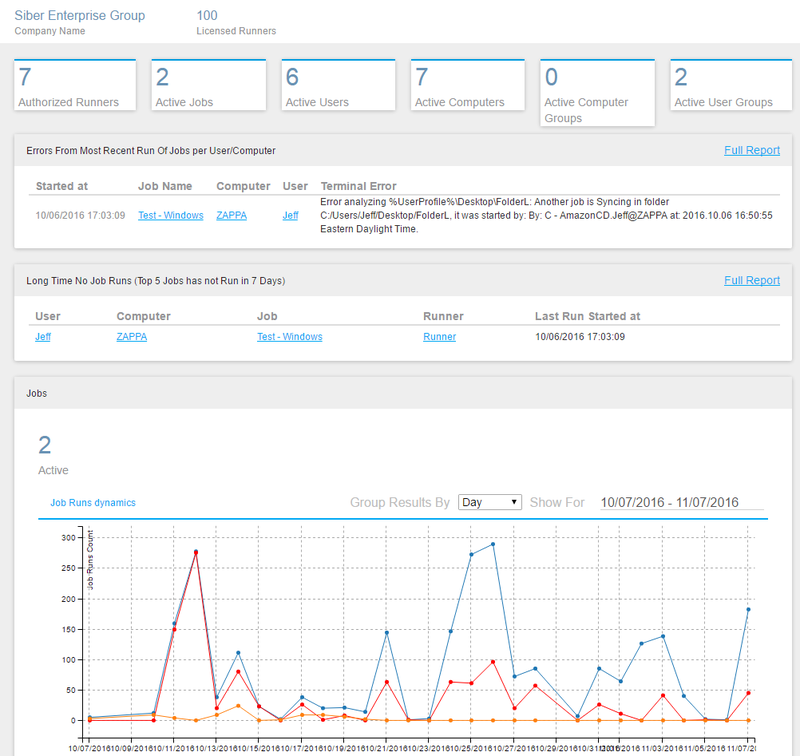 Here is a read-only glance at your primary GoodSync Control Center and Job Runs statistics. At the very top you will see your Control Center counts (Licenses, Runners, Jobs, Users, Computers, etc). Here you will also see a quick glance at your Job Runs statistics, including Errors From Most Recent Run Of Jobs, Long Time No Job Runs, Job Runs Status, etc. A more detailed view of this information can be found under Reports. Company Administrators have full control over all aspects of the Control Center. Group Administrators can manage the Groups they are set as Administrators of, including adding Users, Computers and GoodSync Jobs. 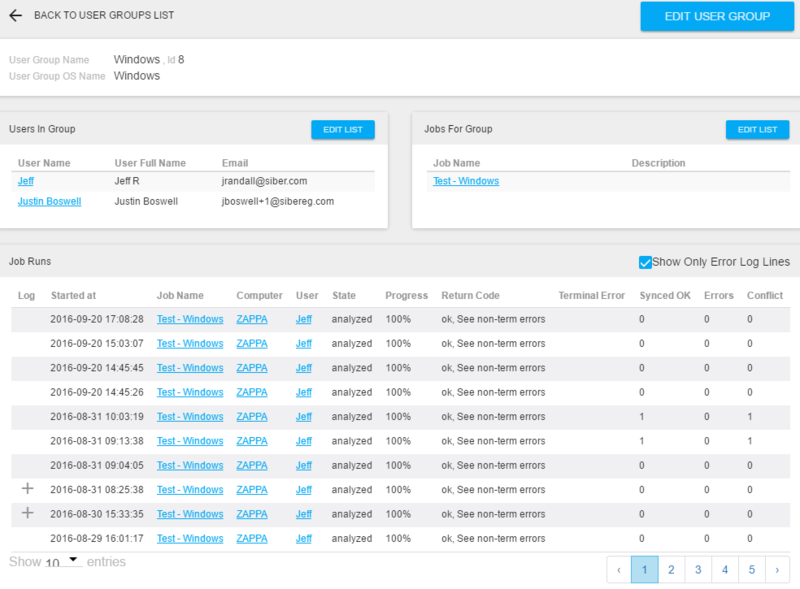 Additionally they can see all Job Runs and other Reports related to the Groups they manage. A User is one of the two primary points of Job Distribution within the Control Center. GoodSync Jobs are assigned to Users and Computers, with a Job being distributed to the Runner based upon being assigned to either a User or Computer. Control Center Users typically correspond with a Windows User Account, Active Directory Account, Mac User Account, Linux User Account, etc. All information about your Control Center Users can be managed here. To start you will see a List of all existing Users, along with their current Status. You can manually Add Users here, or, more typically, allow them to be automatically generated as the Client machines authenticate with Control Center. For more details on setting up a User to receive GoodSync Jobs from the Control Center, please see our User Setup Guide. Clicking on a User, you can update/view all information related to that User, including their Groups, GoodSync Jobs, Runners, and Job Runs. Allows management of Groups of Users. Admins may use Groups to mass deploy GoodSync Jobs to all Users within that Group. To start you will see a List of all existing Groups. 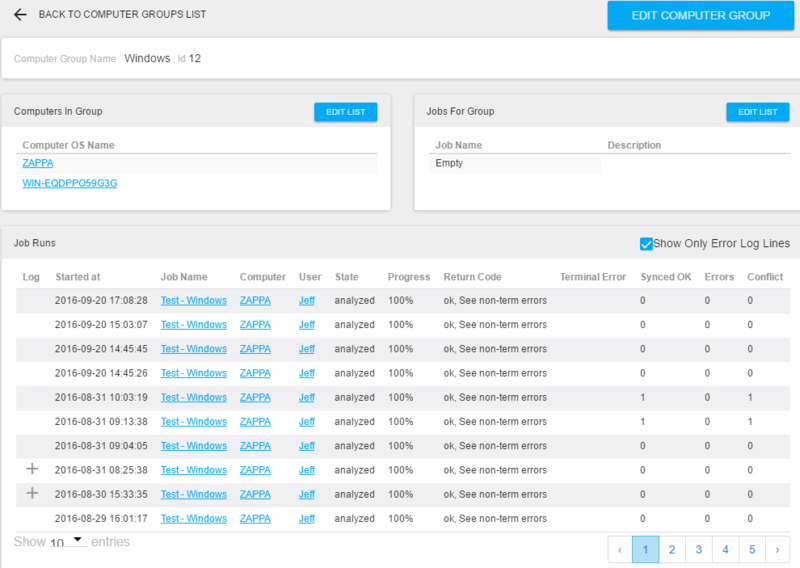 From here, you can update/view all information related to a Group, including assigned Users, GoodSync Jobs, and Job Runs. A Computer is one of the two primary points of Job Distribution within the Control Center. GoodSync Jobs are assigned to Users and Computers, with a Job being distributed to the Runner based upon being assigned to either a User or Computer. Control Center Computers typically correspond with a Windows, Mac, or Linux computer. All information about your Control Center Computers can be managed here. To start you will see a List of all existing Computers, along with their current Status. You can manually Add Computers here, or allow them to be automatically generated as the Client machines authenticate with Control Center. For more details on setting up a Computer to receive GoodSync Jobs from the Control Center, please see our User Setup Guide. Clicking on a Computer, you can update/view all information related to that Computer, including their Groups, GoodSync Jobs, Runners, and Job Runs. Allows management of Groups of Computers. Admins may use Groups to mass deploy GoodSync Jobs to all Computers within that Group. From here, you can update/view all information related to a Group, including assigned Computers, GoodSync Jobs, and Job Runs. Here you can fully manage your GoodSync Jobs through the Control Center. Administrator may add/remove and edit all GoodSync Job options, as well as assign the Job to Users, Computers, and Groups. A GoodSync Job in the Control Center has all of the same options and functionality as a GoodSync Job created in the core product itself. In fact you can create and test your Job in GoodSync, and use the same options in the Control Center in just a few quick steps. All information about your Control Center Jobs can be managed here. To start you will see a List of all existing GoodSync Jobs. You can Add GoodSync Jobs here. The Jobs here have all of the same options as a Job created through the GoodSync GUI, except all Jobs assigned by the Control Center are Run without User Interface, by default. This will open our GoodSync Command Line Builder (a web based interface that allows you to manage all GoodSync Job options), allowing you to setup your specific Job to backup or synchronize any data you require. For more information about all of the GoodSync Job options, please see our Manual, that will guide you through all of the options available. From here, you can update/view all information related to a GoodSync Job, including assigned Users, Computers, and Job Runs. An Account in the Control Center is the same as Account in GoodSync. It contains credenitals for an online Server, stored in an encrypted format. Jobs Sync folders refer to Accounts. One Account may be used by more than one Job. This can only be done by Company Administrators, using our Windows Policies .reg File. Company Admin Email and Company Admin Password. If you specify Account Encryption Password, then Accounts are encrypted by this password, before the upload. You must specify the same password in all GS CC Runners that would run Jobs based on these Accounts. This way you can achieve blind hosting for your Accounts, as nobody on Jobs Server (including Siber Systems admins) will be able to decrypt and read your Accounts, as Encryption Password is known only to Company Admmin and GS CC Runners. Click Accounts to see a read-only view of all uploaded Accounts available for use by Jobs. not Account details, as they are likely encrypted by Company Admin. If you click '+' at the Account, it will show you list of Folders, used by Jobs from this Account. Now that your Accounts are uploaded to the Control Center, you can reference them in your GoodSync Jobs. 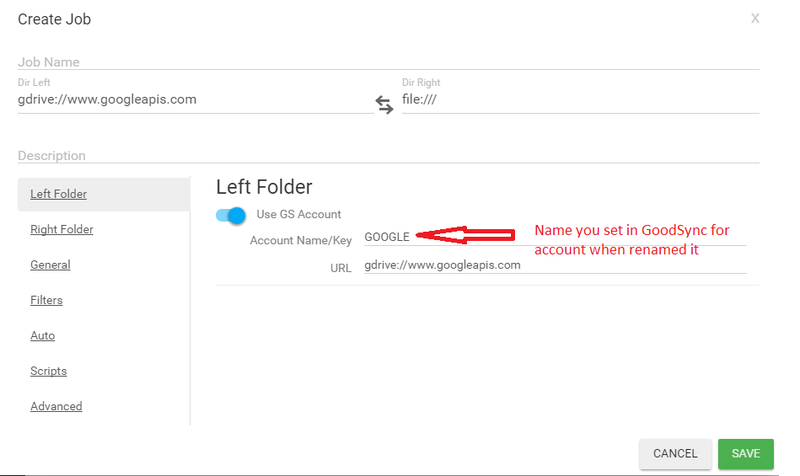 For the File System in question, enable the trigger "Use GS Account"
In field “Account name/key” enter account name which can be like this example “John_Smith-0AINThopIYLUk9PVA”. A Runner is a combination of a specific User on a specific Computer. This is the defaulted authentication method and GoodSync Job assignment vehicle. Each Runner is authorized by an Admin to receive GoodSync Jobs. Jobs can then be assigned to the User and/or Computer from that Runner. Runners are automatically added to the System as the clients are set up. For more details on setting up a Runner to receive GoodSync Jobs from the Control Center, please see our Client Deployment Guide. To start you will see a List of all existing Runners. Directly from here you can Authorize Runners, meaning this User/Computer can now receive assigned GoodSync Jobs. You can also view more information related to a Runner, including Job Runs. GoodSync Runner is a defined as a single user logged in to one computer. Combined number of computers, you would like to have GoodSync service established on, with the total number of users on those computers will give you a total number of GoodSync runners needed for your system. A Job Run corresponds to an individual GoodSync Job doing an instance of a backup or synchronization from a Computer. This is the basic level of Job Reporting, as all other Job reports as derivatives of this information. This is a more complete version of the Job Runs information seen on other screens (User, Computer, Group, GoodSync Job, Runner, etc), as those are a subset of this for that specific item (the individual User, Computer, Group, GoodSync Job, or Runner). To start you will see a List of all recent Job Runs. By Default you see all Job Runs. You can use the Filters to narrow down your list of Job Runs by Date/Time, Job, Computer, User, Status, and more. Expand a Job Run by clicking the magnifying glass icon to the left of the Job Run. This will show detailed log lines from this Job Run. The Control Center Reports show compiled GoodSync Job information on specific Backups and Synchronizations for all Runners. The Control Center Documentation is this page and all sub-pages / sections. The Control Center Settings allow you to make affect how the Control Center behaves and set Global Program Options for GoodSync Clients connecting to the Control Center. The Company ID is needed when configuring the GoodSync Clients. This tells the Client which Company on the Control Center it should be receiving GoodSync jobs from. For more details on setting up a Computer to receive GoodSync Jobs from the Control Center, please see our Client Deployment Guide. Choosing Edit Company Settings will allow you to configure Options that globally affect your GoodSync Control Center installation. Pre Moderate Users will automatically Authorize Runners as they are authenticated, without need for an Admin to do so. Email Authorization will send an email to the User's email address on File to allow a User to Authorize their own Runner without need for an Admin to do so. Allow Administrator Login Only With Confirmed Email will only allow Administrator accounts to log into the control Center if they have already confirmed their email by clicking a link that was sent to them when their account was originally created. 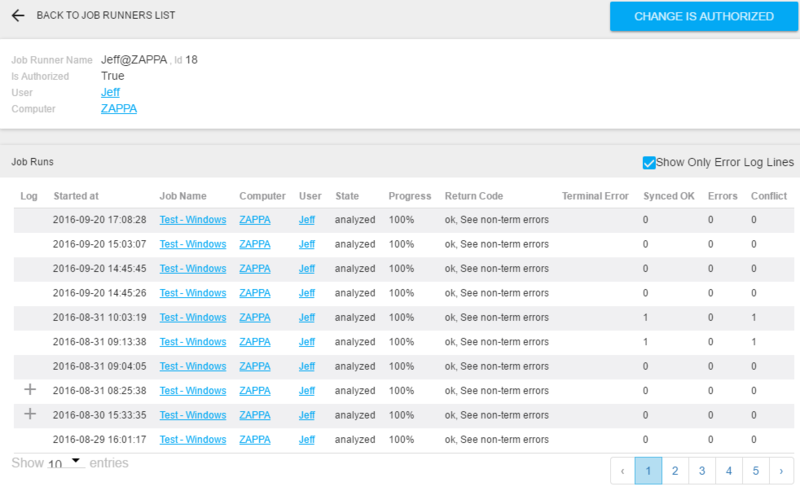 Keep Job Runs Log will determine how long your Job Runs data is kept within the control Center database for Reporting. Choosing Edit Personal Settings will allow you to configure Options that affect the display of information within the GoodSync Control Center for you. Show Jobs has not Run in will detemin the amount of time before a Job shows up on the Dashboard when it has not run in (x) Days or Hours. Date Time Format will allow you to choose between the standard date/time formats supports by the system. This will affect how all dates within the system are displayed for you. This guide will show how to deploye Windows, Mac and Linux Clients that perform backups and syncs on command from Control Center Server. Control Center clients connect to Control Center, receive Jobs for this Client (Runner), execute these jobs and report results to Control Center. The latest version can be downloaded from GoodSync-CC-Runner-Setup.exe. It is recommended to keep all Clients on the same version for comparability purposes. /cc-runner=user Specifies that you want to install User-Space GS CC Runner. /cc-coid=CompanyId sets your Company ID, found on the Settings page on the Control Center UI. /mini-progress=yes|no Show (or not) Mini Progress popup that shows status of Jobs run by gs-runner. /user-close=yes|no Allowe User (or not) to Close gs-runner via its Taskbar icon or MiniProgress popup. GoodSync-CC-Runner-Setup.exe /cc-runner=service /cc-coid=CompanyId /sys-userid="WinUser" /sys-passwd="WinPwd"
/cc-runner=service Specifies that you want to install Service-based GS CC Runner. /sys-userid=Windows User is Windows User, under which Gs Runner service will run. /sys-passwd=Windows Password is a password of this Windows User. /cc-copin=digit-PIN Company PIN, maybe be Set by Company Admin, all install them must specify it. 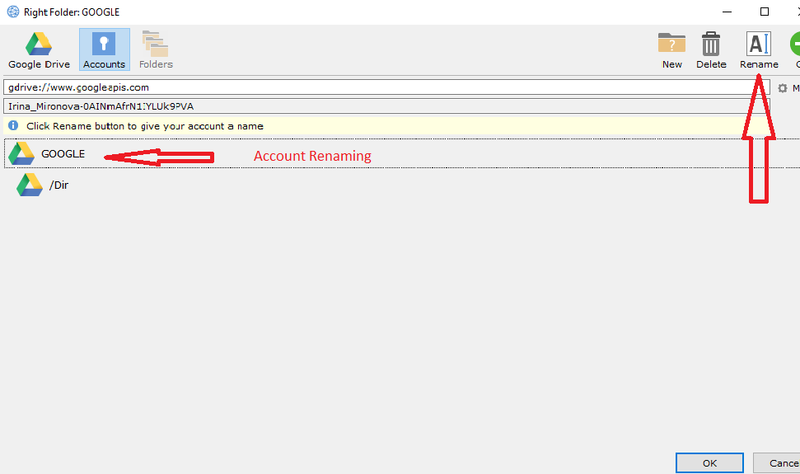 /cc-acct-pwd=password sets Accounts Encryption Password, used to Decrypt Account in Runner. /cc-allow-bad-certs means Allow CC Runner to talk to CC Server that shows Self-Signed Cert (TLS/SSL). /S means run installer in silent mode, without any GUI. CC Runner will start right after install and it will connect to Control Center you specified in the installer. If this Runner have not previously registered in the Control Center, starting the Runner would create both. You can Authorize the Runner, and Jobs assigned to either the User or Computer will start on this Runner. CC Runner in GUI mode will show GoodSync Taskbar icon. This Taskbar icon will indicate what Jobs are now running and it will show results of recently finished Jobs. 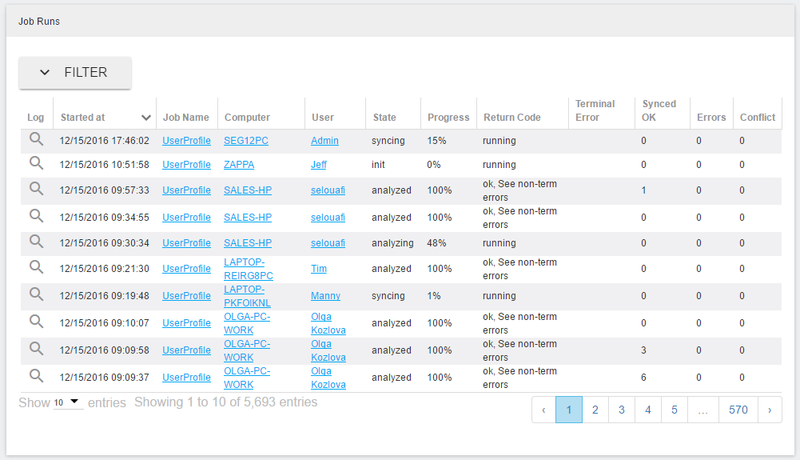 It will also show Mini-Window with information on Status of Running Jobs, if Runner runs any Jobs. If User right-click this Taskbar icon and Exits it, then Runner stops working, and it can be restarted via Start Menu -> GoodSync. GoodSync Jobs assigned from the Control Center will run in the background on this machine, and they will not show up in the GoodSync GUI. You can see what Runner is doing by looking at its logs at C:\Users\User Name\AppData\Roaming\GoodSync. You can Stop and Start Gs Runner Service using Service Manamgement GUI of Windows. GoodSync Runner would automatically download and install new version, when it becomes available. It will restart it too, so the entire upgrade process is completely automatic. The latest version can be downloaded from goodsync-cc-runner-mac.sh. /sys-userid=mac-user sets MacOS User, under which Gs Runner service will run. CC Runner will start right after install and it will connect to Control Center you specfieid in installer. CC Runner in GUI mode will show GoodSync Tray icon. The latest version can be downloaded from cc-runner-install-x86_64-release.run. /S means run installer in silent mode, without requesting confirmation for settings.